#TanningThursday My top tanning tips for a flawless tan! My top tanning tips for a flawless tan! Its #TanningThursday! So I thought why not do a blog post sharing my top tips for a flawless tan. Anyone who knows me knows I am a tan queen. I think there is nothing nicer then having a glowing bronze tan. So here after years of trial and error are a few tips and tricks for that flawless glow. 1.) On the run up to applying my tan or having a spray tan done professional, I exfoliate everyday for three/four days before using exfoliating gloves concentrating on tougher areas of skin such as my knees and elbows. 2.) I apply a rich moisturizer twice a day on the week running up to tanning. I also make sure to drink plenty of water to ensure that my skin is hydrated and silky smooth. 3.) All hair removal should be done prior to the day of tanning. Your skin is very sensitive after shaving/waxing so if tan was applied straight after the skin can become irritated. 4.) On the day of tanning have a shower half an hour before applying tan. In order for your tan to develop perfectly your skin's ph level needs to be balanced. After a shower your skin is anything but, which cause your tan to turn orange instead of bronze. Make sure your skin is completely dry before applying tan. 5.) Apply a small amount of moisturizer to your elbows, wrists, hands, backs of knees, knees, feet and any other troublesome areas, to ensure that the tan does not stick. 6.) When applying your tan rub in circular motions and pat gently to ensure the tan is blended evenly. 7.) Don't think the more tan you apply the darker it will develop, most will rinse off in the shower. Start by applying one coat from head to toe, wait a minute and then apply a second coat. Leave these two coats to develop and then wait until the next day to apply the third coat if you would like a deeper tan. 8.) To prolong your tan avoid body oils and moisturizers containing oil. The oil will weaken the tan and cause it to fade faster. 9.) 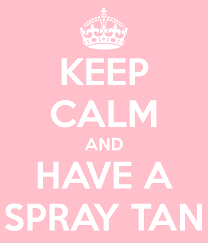 Take time out to apply your tan, save yourself about half an hour to make it less likely to make a mistake. 10.) Find the shade that suits you, I have tried nearly every shade on the market so I do know what I like and what I don't like but everyone is different. I love a deep shade with a natural glow that wears off easily. So girls there you have it my top tanning tips for a flawless tan. I really hope you enjoyed this post and if you would like me to do a post on my top favorite tans let me know. I hope you found these tips helpful and if you have any to add I would love to know!